Collectively we are doing a lot of checking our rear view mirrors these days. I notice a lot of us looking back and wondering if a 1930’s style depression--that boogie man that everyone promised could never happen again--is gaining ground on us. Looking in the rear view mirror can be a very scary thing. That is the thing about fear—things tend to look larger than they are. Looking backwards can also be comforting, even hopeful. I spoke with two elders today, one for lunch and the other on the phone. As elders, they have legitimate concerns about outliving their savings. If the depression starts to gain ground in our rear view mirror, that would have significant consequences for both of them. What struck me was that both elders were looking back in the mirror and finding hope, not fear. Both spoke of the comfort they found in realizing that life generally hadn’t worked out the way they had scripted it. There were twists and turns and things that they never would have foreseen. Without minimizing the hard times, both indicated that what they sense now is a feeling of gratitude. Less for material things, and more for the relationships, experiences, and even struggles they faced. I wonder if this has something to do with realizing you have made it through hard times; that the thing you thought was going to kill you made you stronger…and maybe even a sense of God’s presence in the midst of it all. 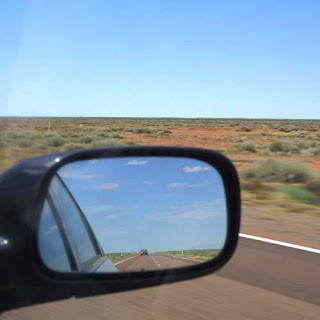 What do you feel when you look in the rear view mirror? When I'm doing the driving, I have to be very careful about staring into the rearview mirror..., it can be dangerous! Just this week I caught myself wondering if the car behind me was going to ride my bumper all the way home. I was getting very anxious. So I deliberately started ahead and focusing on what was ahead of me... letting go of what lies behind. At the next "scheduled" mirror check the car was now following at a "safe" distance. Thanks God! Doug, thanks for reminding us that the "backward" perspective can be a source of hope rather than fear. That's retrospection as inspiration, isn't it? Those elders you spoke with are on to something many of us of forget in the present scramble: that looking back is a vital practice for today. Looking back we see the grace that has brought us "thus far," and we come upon the energy that will sustain us for the journey ahead. Could it be that remembrance is the most radical act? Doug, thanks for the perspective. Many biblical truths are quite simple but radical at the same time. The simple truth that He is control and we have given our lives to Him is what should give us peace. Our life's work is about being in relationship with him. It doesn't mitigate the need to work, grow, care and love others, but it is the focus.